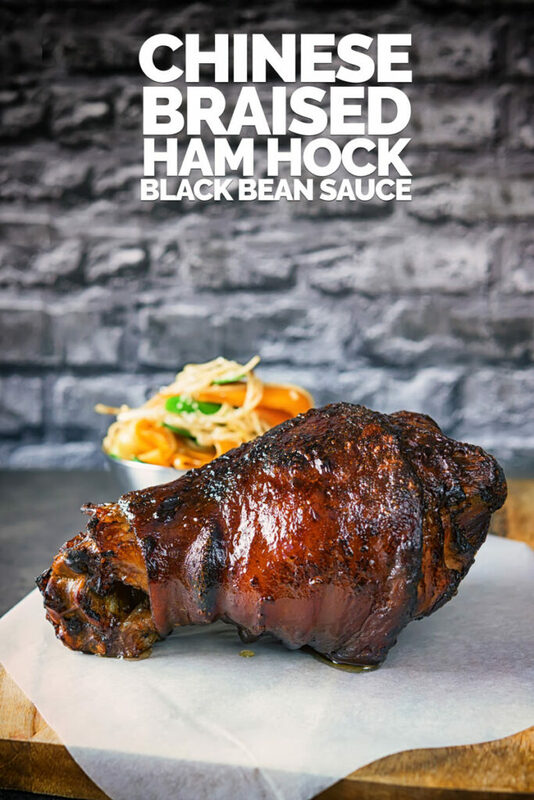 This Chinese Braised Ham Hock recipe is cooked in a black bean sauce based stock and then flashed in the oven for a beautifully glazed finish. Braised Chinese Ham Hock in Black Bean Sauce. Ham hock has featured here a couple of times on Krumpli. Once in a classic crispy pork knuckle recipe the other time in my favourite salad recipe. 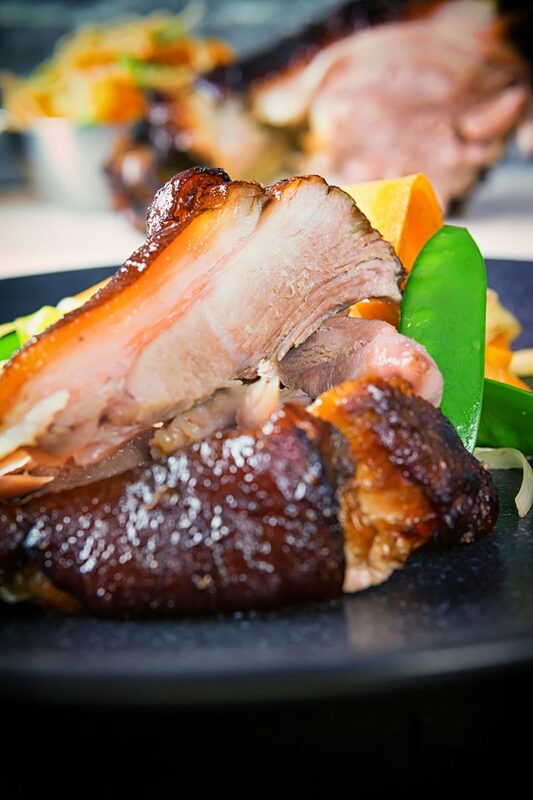 This Chinese pork knuckle recipe could not be more different to these two if it tried. Chinese food has some wonderful recipes for cheaper cuts of meat. 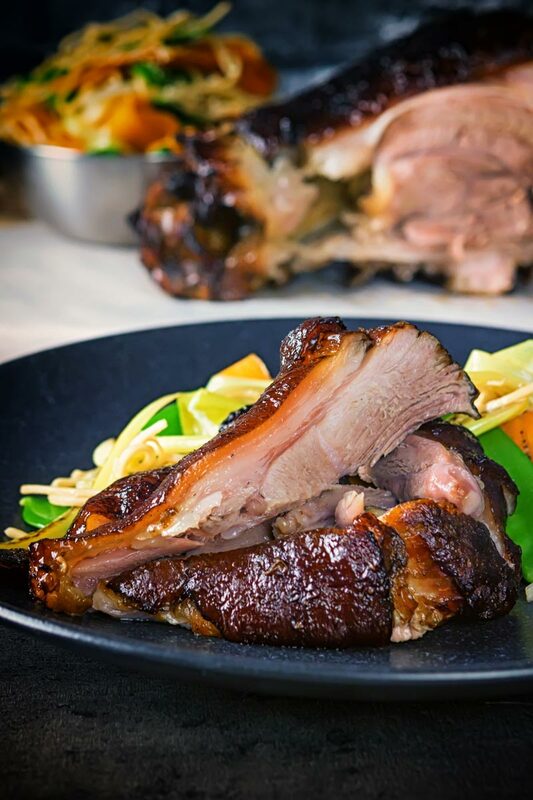 This Chinese ham hock recipe is an adaptation of Chinese pigs trotter recipes. Now I have no issue with eating pigs trotters, in fact, I love them. Sadly my wife is less keen, she finds the gelatinous texture unpalatable. Using the pork knuckle provides a wonderful happy centre ground. With plenty of the gelatinous goodness to go around but also lots of beautifully cooked tender and moist meat! 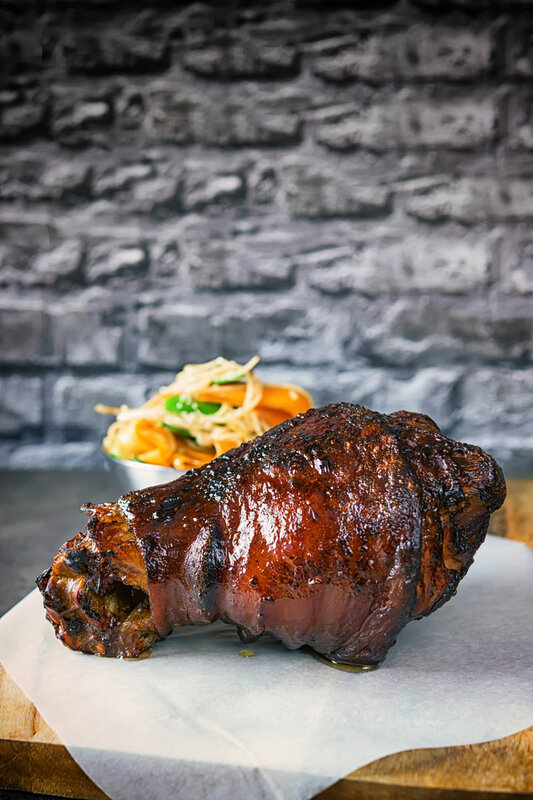 The ham hock is also known as the pork knuckle and the ham shank. It is the bit of the leg between either the shoulder or rump and the foot or trotter on a pig. It is dirt cheap, and much like the shank on beef, lamb or veal, it has the most incredible flavour. In fact, it is exactly the same cut of meat from either beef lamb or veal. We all know how wonderful lamb shanks can taste, and ossobucco is a classic dish. Well, the ham hock is that cut of meat, just from a pig rather than sheep or cow. Most importantly it tastes just as good! However, it is a piece of meat that contains lots of connective tissue and as such can be tough if not cooked gently. But either slowly roasted or braised it is stunning. The Best Cheaper Cuts Of Pork. The humble pig provides a host of wonderful cheaper cuts of meat. All of which are easily capable of standing up to the prime cuts! This recipe features ham hock or pork knuckle, but let’s talk about a couple more hearty cuts of meat that do not put a dent in the wallet. If I were pushed to name my favourite meaty product I would probably say pork belly. It contains the perfect fat to meat ratio and has a wonderful flavour. Like all other cheaper cuts of meat it can benefit from longer slower cooking. But it is surprisingly versatile, it always plays the part of fat content in my homemade sausages. But it can also be dressed up and has in recent years become a favourite in fine dining restaurants across Europe. It is not just because it is cheap, it is because it contains an insane amount of flavour. Either pressed as in this pressed pork belly with cherry recipe or simply roasted pork belly it is an exceptional cut of meat! Yeah baby… Pork ribs are all that and then a little bit more and they cost pennies in comparison to other cuts. If you want to feed a crowd and provide loads of smiles ribs are where you should look. They lend themselves to informal dining and are perfect for taking big flavours. As for cooking take your pick, there are so many ways to cook ribs and a grill is most certainly not the only way. Slow Cooker Char Siu Ribs. Instant Pot Chinese Spare Ribs. So if you are watching your pennies look no further than the good old piggie they are so much more than pork chops and bacon! A slowly baised ham hock is a beautiful thing, this one is braised in a Chinese black bean broth which is then flashed through a hot oven to get a beautiful glaze... This dish is a real stunner from one of the cheapest cuts of meat you can buy! Rub the ham hock with the salt, white pepper and Five Spice. Mix together the vinegar, black bean sauce, soy sauces, and sugar. Heat the cooking oil in a pan large enough to hold your ham hock. When hot sear the ham hock on all sides. Whilst you are doing this chop your red onion into large wedges. When seared remove from the pan and add in the onion and fry for 2-3 minutes. Pour in the black bean sauce mix we prepared earlier and bring to a rapid boil. Return the ham hock to the pan and turn to coat in the sauce. Then add in the chicken stock, Black Pepper Corns, cinnamon stick, star anise, bay leaves and enough water to cover the ham hock completely. Bring this to a simmer then reduce the heat to low-medium and simmer for 2 hours. Heat an oven to 220°C or 450°F. After your ham hock has been cooking for two hours remove and place on a baking tray, then transfer 350ml of the cooking liquid to a hot pan. Bring to a rapid boil then mix and place the cornflour with 3 tablespoons of water and stir into the boiling liquid. When this liquid has thickened pour over the ham hock then roast for 30 minutes. Remove the ham hock from the oven and allow to rest for 10 minutes, this is the perfect time to stir fry your noodles. Cook your noodles as per the instructions on the packet then refresh in cold water. Cut your carrot into to ribbons and the spring onions into long strings. Heat a wok over a fierce heat and when hot add the neutral cooking oil. Stir fry the vegetables for 3-4 minutes, then add a 75ml of the poaching liquid to the pan cooking for a further 30 seconds. Add in the noodles until they have come to temperature. Remove from the heat and drizzle with the sesame oil. 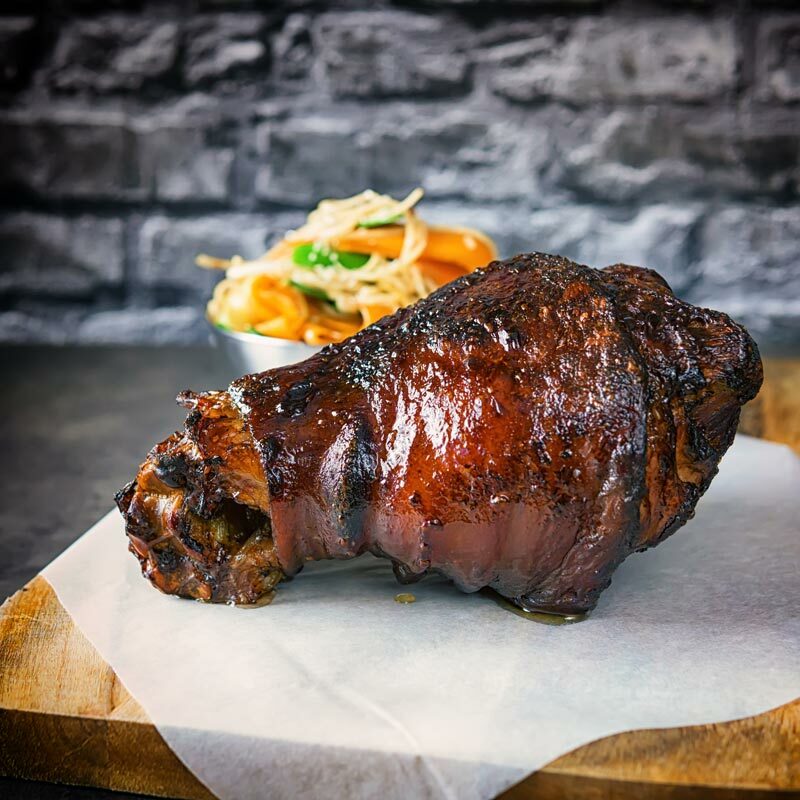 This ham hock recipe looks absolutely scrumptious. I must confess I’ve never cooked a pork shank. Veal and lamb yes! Gotta to try pork! It is superb and really versatile, enjoy. WOW this ham looks perfect! Such a fancy dish for hosting or even for a romantic dinner – simply fabulous! It’s really rather humble really and not fancy at all, although it is rather dramatic as a centerpiece. This is a great idea for dinner. Yum Yum Yum! Cannot wait to try this! Love! Thank you for sharing this great recipe. Oh my! The flavors in your glaze sound so insanely glorious! What a delicious ham hock for the holidays! Black rice vinegar is superb and my everyday choice for Asian recipes, it is incredible.